Don't let anyone persuade you to believe otherwise. 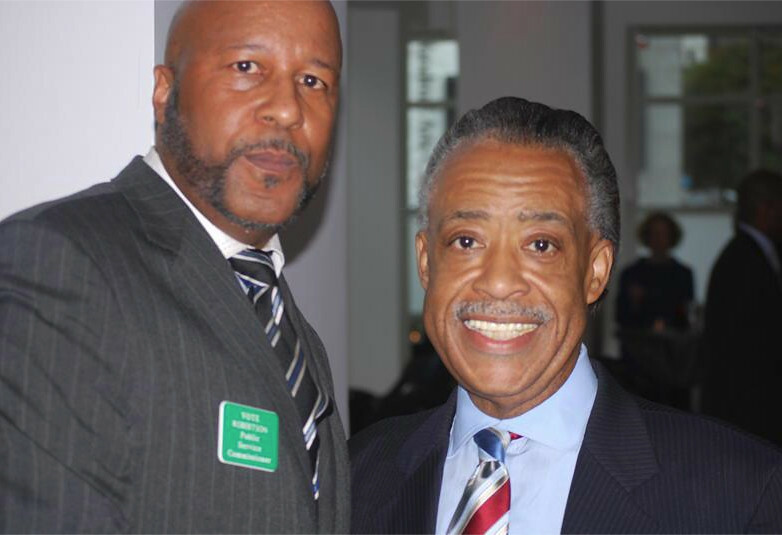 Public Service Commission candidate Lance Robertson (pictured right with 2004 Democrat presidential candidate Al Sharpton) is a liberal running in the Republican primary. So let's move on to why Robertson's candidacy is fatally flawed. Voter registration records, provided by the Secretary of State, show that Lance Robertson is registered to vote at 210 Bill Lucas Drive, Atlanta, Georgia, 30315. Robertson has been registered to vote at that address since March 6, 2003. Robertson's residence would place him in Public Service Commission district three, and would require him to face off against incumbent Chuck Eaton. There is, however, one problem. Lance Robertson was evicted from the residence where he's registered to vote six years ago last week. Fulton County Magistrate Court records show Lance Robertson vacated his 210 Bill Lucas Drive residence on March 16, 2006. Robertson vacated his residence after a dispossessory was filed against him by landlord Melvin Singleton. In addition, Judge Louis Levenson ordered Robertson to pay the plaintiff $5,303.57. The fact that Robertson vacated the residence where he is registered to vote leaves him open to possible residency challenges against his candidacy. The logic being an individual can't possibly claim residency at a location that individual vacated six years ago. No landlord, and I speak from considerable authority on this subject, would re-lease their property to a tenant who left owing thousands of dollars in back rent. So I think it is safe to assume Lance Robertson does not live where he's registered to vote. If Robertson does not currently reside where he's registered to vote; if Robertson does not currently reside at 210 Bill Lucas Drive, Atlanta, Georgia, 30315, then where does he live? Where does he vote? And how does he meet the 12-month residency requirements for Public Service Commission?